Provide comfort for the family of Arthur Webster with a meaningful gesture of sympathy. 96, was peacefully taken to heaven on December 24, 2018. He is survived by his loving wife Ila (Nee Weigand), his children Bonnie Turczynski, Judi Spuris, Robin Starnes, and Randal (Terri); his stepchildren Brad Huotari (Cathy), Cindy LaBuy, Heidi Sykora (Tom). He was the adored grandfather, great- grandfather and great-great grandfather of many. Art was a World War II veteran having served in the Coast Guard Marching Band, Dance Band and Symphony orchestra playing trumpet and French horn. He was a member of the Chicago Federation of Musicians for more than 70 years. He had a passion for music, which was handed down from his grandfather Jan Meyroos who played viola with the Chicago Symphony under the direction of Theodore Thomas and his grandmother Emily Meyroos who played the piano in the silent movie theaters in Chicago. After the war he was employed by Kemper Insurance as an Officer, managing the Special Risk and Commercial Casualty Underwriting Departments. He retired in 1989 after 42 years. During retirement he continued to play trumpet with 5 local bands, including the Highland Park Pops. 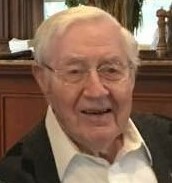 A Memorial Service will be held on Saturday, January 26, 2019 at 10 am at the Presbyterian Church of Palatine, 800 E Palatine Rd, Palatine, IL 60074. To send flowers in memory of Arthur D. Webster, please visit our Heartfelt Sympathies Store. Provide comfort for the family of Arthur D. Webster by sending flowers. Please accept this note of sympathy regarding the loss of Arthur. May the God of all Comfort give you real comfort from the Scriptures. The Bible can be a real source of comfort. It tells us what happens to our loved ones when they die (Eccl 9:5,10), and it tells of the hope of a resurrection where God will bring our loved ones back to life on a paradise Earth, free from sickness (Acts 24:15). I warmly encourage you to visit jw.org to find out more about God's trustworthy promise of the resurrection. Best wishes to you & your family.